Outboard problems - TG for helpful fishermen!! it had simply run out of fuel ...it having leaked out overnight...! rowing .... no use.... So got yet another tow in after signalling to a passing fishing boat (who thought I was just giving a lengthy, friendly wave - they only came to me when I frantically beckoned to them!!) They were all highly amused...!! I was lucky to be anchored in the path of fishermen returning to their little harbour... What makes you think I have no confidence in this 'new' outboard...?? - & the Navionics charts on the chartplotter helped in that they were, again, correctly positioned, as I could see when I passed (in good deep water!) quite close to the flashing reef light, following the (back) leading lights. I'd hoped to make that passage in daylight, but it's clearly perfectly safe at night. from the sugar-cane processing plant close by! Just had midwinter's day here - explains why the sun is rising so late (6.46am), giving a really short day! "Bula!" from Fiji - up the mast! had to inflate dinghy & lower outboard once I'd anchored off, ready to go ashore for check-in.... all ready by 1.30pm. to offload at the processing plant, which was giving off lots of sooty smoke - "Nereida" was soon covered in black specks. It's Z+12 here, so at least reading the chart-table clock, set to GMT, is easy!! And I found my instructions for re-setting my barometer/clock - so that's finally been changed to local time now, not the Mexican winter time (PST - 1) it's been showing since leaving Zihuatanejo in March! This is an excellent, large, cruising area, inside the barrier reef - lots of little islands to explore. light down in the bow ... good to have the spares on board, although chandlery here is quite good. time over the day to get to an Internet cafe (F$1/hr, including use of headphones for Skype - about 50 US cents per hour!!) and to Fiji Meats for some good, fresh, inexpensive meat for my forthcoming passage (they will vacuum pack & freeze meat if you ask them). I was interested to see the little single-track railway bringing in high loads of newly-harvested sugar cane in tiny trucks from further south to the Lautoka processing plant which I was told operates continuously from June to early December. I gather the NZ High Commissioner was expelled from Suva on Thursday - but no-one seems to know exactly why (except maybe a personality clash?)!! Also heard on Sunday there'd been a major earthquake in the Solomons - tremors being felt here - but that's well off my path. I hope to clear out tomorrow morning (2 days later than planned), ready to leave for Port Vila, Vanuatu - a 5-day passage. "Nereida" crosses the Date Line - now officially East of Greenwich! Spoke to people on 'Rag' net (8173) this morning about forthcoming passage to Fiji - may get someone about to enter Suva tomorrow to see how long it takes to get cruising permit - otherwise consensus seemed to be to head straight for Lautoka (if only one stop, to clear in & out , no cruising permit needed). Have a few days to firm up on where I'll make landfall in Viti Levu (Fiji), since either way I just head due west from here. E winds are forecast, so will be dead downwind. down with locals going back to Neiafu. (I'd seen the line on coming in & thought my anchor & chain was well clear of it!) Hadn't realized there was a problem with this Moorings-recommended anchorage until I arrived rather too late to go to any other. this area when the sun was in the wrong direction to see clearly where marked coral heads or reef areas near my path were!! It'll be nice to get out to the safety of deep ocean tomorrow!! It has been very useful to have the accurate Moorings paper chart that Derek, the manager here, kindly gave me on Friday. Unusually, the Nobeltec chart is not detasiled enough & the Navionics charts used on the chartplotter, while far better & nice & clear, is positioned 2 cables N and W of where it should be for GPS input - not a lot, but enough!! Got away early as planned, in good wind, and the volcanic shape of Late Island was fading away to the ESE as night fell. The new volcanic island is about 20ml S of Late Island - I passed over a fault line with lots of recent volcanic activity with some trepidation! At 0343, I saw two bright points of light on the horizon astern - wondered what they could be - they got brighter & larger.... & then joined up to form a delicate crescent moon 'flat on its back'!! I had to be careful of my route - too many isolated islands & BIG reefs around Fiji area. At 0420, I'd taken the pole down after the wind had veered suddenly & backed the genoa - presumably under a cloud. I had to work on the sails in the moonless dark using my headlamp for light - what a blessing that headlamp is, leaving hands free for work..! The rest of the day was a delight in that it was mainly sunny & the wind went more SE, up to 15-20 knots, so we made excellent speed, broad reaching, often at 6-7knots. Of course, the downside of constant strong wind is that the swell builds up - back to a 'bumpy' ride again!! requires the inverter since it blows the 12V circuit whenever I try to power it that way, so that's a major power requirement now... Oh, what fun computers are...! reef, east of Vatulele Island to the NW of here. The radar is showing that the GPS positioning on the C70 chartplotter is OK - always a relief to see that at night. Expect to be safely in port at Lautoka tomorrow around midday - major reef entrance beforehand and then we'll see how well the Fijians conduct their clearance-in & out procedures... I hear there's a public holiday on Monday. I just lost a day! in the morning - no, I've not set foot on shore as yet...!! Seems like a nice place... counted over 50 yachts here in the very protected harbour!! an anchor watch - so I could see immediately if I dragged - & decided, after waiting a bit, that I seemed safe enough to sleep, intending to take a buoy in daylight. I was awakened around midday by a call from a dinghy with divers in - a dozen more buoys had just been laid - & I was advised to pick one up. I thought I'd better do that immediately, in case I needed to call on 'Nuie Dive' to help retrieve my anchor if it were stuck in the old coral of the seabed! But all went fine, including my unaided picking up of the buoy despite the gusty wind, which I felt pleased about...! Customs clearance went fine - I found all the Nuians to be very friendly people - & I then went over to the 'Nuie Yacht Club' to meet Mamata - a very helpful, nice lady who seemed to know everyone on the island & was able to answer any questions. Her husband Jim runs the Y.C. and mooring buoys. day without rain, but couldn't find a single place to get even a soft drink or coffee!! There are few hotels but some houses/apartments for rent. of absent Nuians gone elsewhere for work, gives many of the villages a derelict appearance. island is surrounded by a step - a 'ledge' of foreshore reef which drops away almost immediately to great depths. It's definitely a place to 'get away from it all' among friendly locals - refreshing! But don't look for any gourmet cooking...! By the way, I heard, & then saw, a whale just off Nereida's stern overnight on Saturday. Sun/Mon 3rd/4th June: Left for Tonga - heavy rain overnight & during morning, so I didn't leave until mid-afternoon, after dealing with dinghy & outboard & partly refuelling with diesel from jerry cans. The wind was following, around 16 knots, so I soon shook out all reefs, poled out the genoa to go goosewinged & was soon rolling around in the usual 1-2m ESE, quartering seas - but making good speed (6-6.5 knots) in sunshine, which was a nice change from the overcast I've seen so much of lately. Overnight & Monday, the wind swung around a bit, so I had to gybe onto starboard tack & later gybed back again, to keep the mains'l from backing - we're pretty well on a dead run which is always a difficult point of sail... but at least we're sailing & not motoring! The wind has died a bit over the day to around 10 knots (ESE3-4) but I expect to reach Neiafu by mid-afternoon tomorrow (Tues 5th) which means I should have the sun nicely behind me when I head east through the reef area to the anchorage. Friday 25th May: Sea has glassy surface with slight wind ripples (2-3 kn from ENE) and long, slow, gentle SE swell... All the weather info I'm getting shows a low stuck nearby to SW of me & a trough to N of me. Very light winds forecast for several more days - no chance of sailing, it seems, so must fill starboard tank shortly from jerry cans. Have switched to port fuel tank and also made the decision to skip Aitutaki (in the Cook Islands) - not worth the time spent motoring there, anchoring (outside reef - not deep enough for me to pass inside safely), inflating & lowering dinghy (& outboard), maybe having to clear in also & then finding no fuel in easy reach... So I'm heading (motoring) to Niue directly now. I calculate I've nearly enough fuel to motor all the way gently! I must leave some fuel in reserve so may end up wallowing for a bit, pretending to sail, if wind picks up a touch!! Didn't expect this much calm weather in SE Trades belt - variable, maybe - but flat calm....?? Southern Doldrums...! At least I have no worries with regard to food or water!! My main concern is that 'smart' battery regulator is not always behaving as smartly as it should, when motoring. When the batteries are fully charged, it keeps on piling in the charge - so they end up overcharged - I keep having to keep an eye on the voltage & turn off the secondary alternator to stop charging. It's easier at night because I run all the lights etc I can, and it seems to cope better. Time is getting very confusing!! I've recently re-set my chart table clock to keep accurate GMT, my ship's clock (in the main cabin) is showing Mexican time (PDT-1) from when I left Zihuatanejo, this computer is showing PDT (& also UTC), I'm speaking to Russell Radio who refers to NZ time... and my actual correct local (zone) time (at 158W) has just now changed from GMT-10 (Tahiti time) to GMT-11 !!! I'm sticking up notes to myself to keep on top of it all! Hate to think of the state of confusion I'll be in when I get to the Date Line... and then Fiji...!! Later(8pm): The boat just got a good rinsing - just had some rain! I sailed for all of 35 mins under a raincloud before the wind died back to 3 knots again....! Sat/Sun: Flat, flat calm most of the time, with wind getting up to 6-7knots later on Sunday - and finally switching from N to SSE - a good sign. Hopefully, it will strengthen more, as forecast, by tomorrow or Tuesday, to get sailing properly. I've spent a lot of time finding out how to download weatherfaxes directly from New Zealand and Australian Met Offices using my SSB and modem to laptop (as for Winlink & Sailmail) - also finding which frequencies give the best picture (some can be unreadable - just a lot of black blobs!). Very useful info, once it all works, although yet another item where you have to get the timing spot-on (or miss the transmission completely!). It would have been nice to have had a standalone unit that just gets on with it - but Furuno had a 'hiccup' in their production of an updated version of theirs & it's supposed not to be available until later this year - or so they said in January. Midnight Sunday - turned off motor for all of two hours thinking wind might be increasing... then realized that we were sailing at 1/2 kn - not getting very far...! Actually spent time over the weekend reading a novel ('The Englishman's Boy') - haven't managed that for some time..! Very good one, too! Monday morning (28th May): SAILING!!!! Around sunrise, I realized wind had increased enough - to SSE 11 knots - so finally switched off engine - so good to have peace & quiet again while making way under sail nicely!! Wind increased to F6 over most of yesterday & overnight (around 20-25kn). We're between a low & a trough.. Had triple-reefed main with small genoa & was still making 6-6.5kn boatspeed. Wind has died back a bit now (midday) but we're still getting hit regularly by big, rough swell (3-3.5m) that has built up - my coffee mug jumped up & spilled twice, even though it was on the gimballed stove! Expect to make Niue early Thurs 31st May. Deliberately trying NOT to go too fast - want to avoid getting to the anchorage in NW Niue in the dark. 125francs/l, instead of twice that at the duty-free price of 69 francs/l ... and left with a 'bad taste in my mouth' from their unfriendly attitude. However, I was cheered up soon after by managing to pick up a mooring buoy unaided, on returning to Bloody Mary's - where I went for a nice meal later! Took time to hoist outboard & dinghy, deflate & stow dinghy... Released buoy around midday & sailed over to reef passage - motor-sailed out in flukey winds. ENE wind, dead astern... Long slow swell from SE and another competing swell from ENE. I've spent quite a time today trying to find weather info sources via Winlink & Sailmail. Interestingly, when I looked at a f'cast issued from Fiji, it mentioned that the ITCZ was causing unsettled weather & gave its coordinates.... passing right through where I am! Obviously, the cause of the squall overnight. Also of interest - the barometer has not given any indication of use - it's stayed roughly constant at around 1012 for over two days. I'm looking around me now, before going below to post this via my SSB radio - bright sunshine, almost no clouds in sight, except a grey mass on the N horizon (that ITCZ...! ), motoring gently, to conserve fuel, with sails pretending to help, in 5 knots of N wind & a long, slow, SE swell. Haven't seen another boat since early Tuesday night and don't expect to sight land (possibly Aitutaki) for over two days. Time for a mug of tea.... and to decide what to eat tonight. Yesterday's meal was steak and onions with fresh broccoli and fried potatoes! Had a nice sail over from Moorea initially, but slowly wind died down so I ended up motoring overnight, knowing I could top up in Bora Bora. At daybreak, I was passing Raiatea, with Bora Bora just visible in the distance. The wind came up as I reached the SW end of Bora Bora, so I was able to have a nice peaceful breakfast under sail, watching the surf crashing spectacularly onto the reef as I passed towards the well-marked reef passage into the lagoon. Although there are clearly lots of hotels and tourist development here, it's all fairly low-level and doesn't seem to me to detract from the scenery too much - not from the water, at least. I'd better send this now, so I can get to the 'gendarmerie' well before midday in case they close then. The good news is that I now have propane flowing into my cooker - so coffees, teas and cooking are all possible now that I've replaced the gas regulator - what a lot of time, walking & effort over six days that has involved! Had to ask for help from kind people at the marina twice - once for male muscle-power (!!) to undo a gas-pipe connection and once for a second pair of hands to push two bits close to each other while I screwed them together (I needed four hands for that job - impossible!). I gave up trying to leave on Wednesday, being busy well after noon, with the bonus of finding that I was in a relatively safe marina berth while a nasty frontal weather system passed over, giving heavy rain & strong winds. There was also a big southerly swell & I could see the breakers crashing onto the reef near the pass I had intended leaving by. I also gained the company of two other cruising boats: 'Far Niente' & 'Southern Star' berthed close by & we ended up socializing during the evening - a pleasant change from my jobs! So I finally left Tahiti for Moorea at noon on Thursday - 3 days later than intended. Straight into 25-30 knot headwinds down the channel leading to Papeete Pass! Only the thought that once outside my course to Moorea would put the wind abaft the beam stopped me from heading back to the marina, as I hurriedly put 3 reefs in the mains'l waiting to be raised...! In the event, the winds reduced somewhat as I got further out & I had a lovely/lively sail over.... very enjoyable. What dramatic scenery Moorea has - high, steep-sided, jagged mountains - clearly of volcanic origin - covered in greenery. I dropped anchor near the head of Opunohu Bay - & was promptly invited over to the only other boat nearby for a sundowner. The next morning, I moved anchorage to be close to the outer reef, not far from the pass, to be able to enjoy some snorkelling ....and also to be within range of Wi-Fi internet access! Again, I was invited over to a nearby boat for the evening... and people think single-handers are lonely...?!! Unfortunately, I'm now having a problem with my 12V circuit - it keeps blowing when I connect my laptop to the outlet at the chart table and also when I connected in at the cockpit with a different plug.... more investigation needed.. the 12V circuit wiring has also been suspect since San Diego - may need 'beefing up' to be able to take the load. 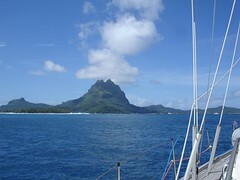 Saturday morning, I shall sail to Bora Bora - an overnight passage of about 135 mls - just over a day away. P.S. I'm now nearer to New Zealand than to Hawaii... & Sydney is closer than San Diego!! 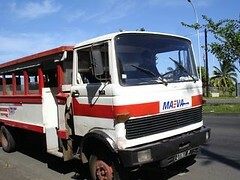 'Le Truck' - local bus from Taina to Papeete. I'm in chaos here - major problems sorting out propane system (no cooking possible still) and changed engine oil, but unfortunately didn't tighten filter enough so most of new oil spewed out on starting engine - had to buy more oil & screw on the filter again, so tomorrow's job list includes cleaning oil from under the engine (yet again!!) & topping up and starting the engine - with fingers crossed I get it right this time...! One & half hrs later I had the motor running & I made my way through the well-marked channel inside the shallow fringing reef around from Papeete to Taina. There's a big supermarket within walking distance, friendly, helpful marina & fuel dock staff & a local bus - 'Le Truck' - into Papeete town (130fr), a good 20 minutes drive away. I'm hoping to sort out the propane regulator tomorrow (the present one leaks badly). The only possible replacement one on offer is twice the size of the present one so may not fit into the space, but I did find the brass connections needed to adapt it to use in my system. Tahiti Gaz also said they couldn't fill one of my 3 gas bottles - a valve was faulty & they can't replace it - Cairns, perhaps?? With any luck, I'll be able to leave for Moorea on Wednesday... In the meantime, the view I have from the boat is of Moorea & its jagged mountaintops across the reef from here & each day I have a dip in crystal clear water.... I'm constantly reminded of the definition of cruising as "dealing with boat problems in exotic places"...!! What wonderful snorkelling here! Nereida anchored in turquoise blue water (over white sand) with her own pair of fish that stick to sharks etc (have sucker pad on top of head) that took up residence - to clean 'Nereida' or were they just hoping for scraps?? The reef nearby inside Timatu Pass, called 'The Aquarium' for obvious reasons, is full of beautifully coloured coral. The locals take people there and then feed the fish with bread and large fishheads - attracting hundreds of fish of all shapes and sizes in so doing - also black-tipped reef sharks! I counted four really big ones and a tiny baby one on Tuesday - they stayed near the sea bottom but I kept a wary eye on them to make sure they didn't get too close to me!!! A bit later I saw a big leopard moray (had leopard-like markings all over large grey/brown body), having already spotted an enormous plain grey one on Monday - it was very aggressive and definitely followed me for a bit! And always there is such a variety of fish of all kinds, often in shoals, many I've not seen before. Snorkelling has become a 'must' every afternoon, in company, usually, with 'Can Kata' and 'Dreamweaver'. One day, I dinghied over to the resort hotel dock nearby & had a very nice seafood salad in company with a French couple. Another day, I visited Avarotu, the other 'town' 5mls WNW of this anchorage. It didn't take long to wander around everywhere, watch some volleyball, get a few tomatoes (& some Polynesian francs at 80 to the US dollar) & have lunch (chicken&chips for me, providing a drumstick for the next day's lunch on passage!). Had to avoid lots of hazardous connected lines of pots on the way (black pearls are a major 'industry' here). One job I got done was to give the cockpit sole a thorough cleaning - it needed attention badly since the cockpit drains were thoroughly blocked. I also found a ballpoint pen, plenty of fluff etc and lots of almonds my guests had obviously dropped the other night when they came for sundowners!! One of the screws on my starboard genoa car seems to be coming loose, yet I can't tighten it.. Another outstanding job (for the calm water of Tahiti) is to go up the mast for tricolour bulb replacement. That's in addition to propane bits & pieces - & refilling propane gas cylinders, hopefully. On Wednesday evening I left as planned and safely took the close-to-shore short-cut to Tiputa Pass (min depth 6m for a very short time!). My main slight worry after leaving and coming around on the outside of the atoll was seeing an enormous dark grey cloud well ahead in the fading light - clearly a big, rainsquall.. but it stayed out of my way! I'm glad to say that both Nobeltec on my laptop and the Navionics chips used in the Raymarine chartplotter are using very up-to-date French charts - they both seem spot on in GPS positioning -quite a relief on an overnight passage skirting this big atoll in pitch darkness. (The Nobeltec software is so much easier to use for routeing than the chart-plotter). I have radar on also, of course, and there's actually a small lighthouse flashing clearly on the NW corner that I have to round. I'm motoring & expect very light winds for most of this passage, according to my weather info. I expect to reach Papeete, on Tahiti Nui, early morning on Friday 11th May... at present, I'm motoring in a glassy calm sea! I'm now on a 4-5 day passage from the Marquesas to the Tuamotus (Rangiroa atoll), having had an absolutely brilliant sail so far, since leaving Nuku Hiva yesterday. Perfect trade-wind weather, although with accompanying swell!! I'm also slowly recovering from the bad cold I picked up after landfall, so today has been very enjoyable. I enjoyed my quick tour of the Marquesas - scenery was frequently spectacular and always superb! It was nice to relax & meet with people, although it was lengthy, hard work re-fuelling via jerry cans, with a trip to fill them up at a high concrete fuel dock in big swell. Fortunately, I had help with that - I could never have managed to get two, full, 20l jerry cans down into the dinghy otherwise.. I'm also feeling really good just now because I'm hoping I may have sorted out my ongoing radio problem. I found a loose/very slightly corroded ground connection - so I'm finally making radio connections for emails & weather- & being heard far better over the radio. If this arrives OK, you'll know that my radio is definitely better! Ua Pou to Nuku Hiva 27 April07 ... Sociable cruising! to invite me for a meal on Sunday evening... and later that day, Greg ("Seven Thunders") invited me out with "Magnum" for a meal on the terrace at the local 'posh' resort hotel high up overlooking the bay that evening. My social diary gets very full!! (reliable satellite system) and Iridium, means I'm not totally out of touch despite radio problems. And even my English cellphone works here close to the islands! I still have several other jobs outstanding, but having a bad sore throat and cold (which explains my feeling so very tired on Friday when I got here) have made me disinclined to over-exert myself this weekend. Manana!!" Arrived Hakahetau Bay, Ua Pou island, at 9 am this morning after a good overnight sail from Hiva Oa where I had checked in with the local 'gendarme' with little fuss, since I'm an EC citizen. Unlike Canadian/US friends who had to pay a large amount for a 'bond' and spend two days using an agent before they had finished clearing in to French Polynesia - big hassle for them! I'm anchored in a wide open bay, looking at green mountainsides, rather rolly due to swell with surf breaking on black rocks nearby & a steep black beach behind which is a tiny village with a red-roofed church spire peeking through the trees lining the beach. High volcanic 'spires' and mountain tops tower over all - reaching up into perpetual dark grey clouds, although it's sunny out here in the bay!! It's always nice to have friends helping in difficult situations - & few cruisers enjoy anchoring bow & stern - especially true of me as a singlehander in a crowded anchorage - so it was great to have help both after entering (from 'Jade') & on leaving (from 'Wyntersea'). Atuona, the nearby village where I checked in was accessed by dinghying in to the nearby dock and then hitching a 10 minute lift, both there and back, from one of the passing locals who invariably were happy to give a lift (no buses around here!) & chat on the way (good French practice). It's fame lies with Paul Gauguin, who lived the last few years of his life here, and Jacques Brel, a well-known Belgian singer, who similarly settled here & died early, after illness. Both of their remains lie in the cemetery high above the village, with great views over to seaward. There is a museum dedicated to Gauguin in a beautiful building constructed in local fashion of wood, plaited palm leaves & thatching - very cool and full of copies of his paintings, giving a good overview of his life and artistic development. Nearby is a replica of the house he had built in the village and where he ended his days. Espace Jaques Brel houses the small aeroplane he introduced to bring medical/dental and other help to Hiva Oa from Tahiti (in the 1950's) in the days when all French aid seem to go solely to that island, and the other islands were largely ignored. It also gives an overview of the songwriter's life, with his songs played in the background - an excellent test of my very rusty French since nothing was in English! His was the era of Gilbert Becaud, etc. wear a fresh flower on their ear & I've also seen many wearing a headband of woven flowers, again as an everyday adornment. I enjoyed my first fresh French baguette, straight out of the village baker's oven, and wandered around the local store - everything is ridiculously expensive, so I was pleased not to need much, mainly looking for fresh tomatoes etc. In the anchorage, as elsewhere since arriving in the Marquesas, I was struck by the large number of European boats (many from the Panama Canal via the Galapagos Islands) and the small number of the U.S. boats I'd become used to seeing. I dinghied to shore with some empty jerry cans to get a little diesel from the nearby fuel station, ready for leaving for Ua Pou, making good use of my fold-up 'cart' on the return journey to the dock... the first of many such refuellings in the Pacific, I'm thinking! Around midday (local time) on Thursday 19th April, "Nereida" finally came to rest in spectacular Hanavave Bay on the island of Fatu Hiva, in the Marquesas - the scenery was truly awesome with enormously high sharp mountain peaks (edges of 3 craters) very close and the land dropping almost vertically down to the small village at the head of the bay. The hillside close by has many coconut palms and is very green. Occasionally, I hear goats calling and beautiful birdsong, in between the sound of the surf breaking onto the rocks edging the bay. The rocks are volcanic black and there is a perpetual dark grey cloud sweeping towards the bay from the mountains - with frequent heavy showers as a result! I had a really good sleep for a few hours and then found a local outrigger canoe nearby with a woman who was offering a local meal that evening to the boats in the bay (there were about 8, mainly European arrived from Panama/Galapagos). I thought that sounded like an excellent way to celebrate my landfall so accepted - but none of the others were interested so, in the event, it didn't happen, but it enabled me to be taken ashore without inflating my dinghy!! She (Andrea) then proceeded to take me on a tour of the village, very green & full of fruit trees with just one shop where I was able to change US dollars into French Polynesian francs - BIG coins and paper money just like the old French before Euros. 80francs to 1 US dollar and everything very expensive as well means that whatever you buy, the amount is very large! Friday 20th: Decided to stay and relax in these dramatic surroundings. But I also had to fix the windlass - it would not drop ground tackle when free-running under gravity due to salt crystals and corrosion. Making use of water, and the judicious use of a hammer, I gave it a good clean & service - it's running freely now. Saturday 21st: Problem with gas solenoid cut-off switch for propane from gas tanks - could not cook! I went to make a mug of tea to reward myself after cleaning and tidying up after the passage - no gas. I had to remove the solenoid completely - there was a lot of water inside it so it's hardly surprising it gave up! I've no spare but at least I can cook now. Did a few other minor jobs - a workday in (very rainy) Paradise! That evening, a fisherman came by the boat . I exchanged tuna (I made ceviche) + four enormous grapefruit for a small bottle of whisky! Sunday 22nd: Had a lovely 45 NM beam reach to Atuona on Hiva Oa (Paul Gaugin's village). Celebratory evening with 'Jade' & 'Wyntersea' - first time we'd met up since Manzanillo in Mexico! Please bear with me, updates may be sporadic until communication issues resolved! Days 23/24 Tues/Wed 17/18Apr07 - Landfall imminent! Despite many attempts to connect & send or receive emails by radio - no joy... Very occasionally, I'd get Sailmail (not Winlink) 'connection' - painfully slow due to poor signal strength. If connected, downloads are impressively fast! Only one station I find I can connect with - at San Luis Obispo. Came up with 'ploy' to get Winlink position report uploaded via friendly PMBO (Winlink Station) - I'm hoping that's working OK. Uses satellite email (Inmarsat-C) which costs, so messages kept short & abbreviated! Both days have been very pleasant, with Nereida sailing at quite good speed (5 - 6 knots) under blue skies with little clouds, mainly on beam reach in E winds, occasionally close-hauled when wind veered ESE. Grey clouds disappeared, although I saw some lightning in clouds on the far W horizon on Tuesday evening around sunset - luckily, they kept well away! The Equatorial current has kept up: 0.3-1.0 kn. Lovely to have such a consistent 'push' for such a long time! Still have fresh fruit & vegetables - & a grapefruit I'm keeping for celebrating when I make landfall in Hanavave Bay on Fatu Hiva - Thursday a.m. in daylight, if I keep up my present speed. Tues 1800GMT: 06 36'S, 136 11'W. 108mls by log (133ml actual). Distance to go to Fatu Hiva: 268ml. Wed 1800GMT: 08 32'S, 137 26'W. 116mls run by log (138ml actual). Dist to go to Fatu Hiva:130ml. Days21/22 Sun/Mon 15/16April07 - Rain squalls! A day of no wind, or too much wind, rain, big grey clouds, squalls, blue skies ... a real mix! Kept me busy! And often wet! Wind was all over the place - but always in the 'East quadrant' I even poled out the genoa in light winds this morning, only to find we were, by the time I'd finished, on a beam reach... grrr!!! After sunset, we finally escaped from the belt of bad weather & have been sailing closehauled, beautifully fast, ever since. Been busy finalizing my passage plan to & beyond Australia in detail - weather permitting! 1800GMT position: 02deg 50'S, 133deg 32'W Just 88mls run by log (actually 113ml over the ground) - too little wind! Distance to go to Fatu Hiva: 544ml. More grey clouds, rain & strong winds. Had a fast, close-hauled ride overnight, with reefed main, putting in a 2nd reef during this morning when winds went up to around 25kn & gusting - we've been making excellent speed! And that lovely Equatorial current is still doing its bit, helping us along often by over 1.5 kn! Now (3.35pm PDT), the wind has backed to the NE & we're running goose-winged under white clouds. So much for the 'SE Trades'!! And now (6.20pm PDT) - pole has had to be taken down - wind veered to E and we're on a beam reach.... it's all go!! Day20 Saturday14Apr07 - Better sailing from now..? Maybe not! I thought wind was becoming more consistent, it being very light this morning when we started sailing again, an hour after sunrise, then gradually filling in so that by mid-afternoon we were beam-reaching at around 4-4.5 knots, with the current helping again, ending up doing ~5.5kn over the ground. But later on it went E-ENE (abaft the beam) 8-10 knots - so this evening we've been struggling to make 3kn boatspeed, ~4knots SOG. The SE swell is not too bad so life on board is generally very pleasant, except when we've little boatspeed and then we get knocked about by the swell which is on the beam (our course is 215T) and the sails flap like mad. Sailing along at these slow speeds is certainly conducive to a relaxed mental attitude: nothing you can do about it - shrug your shoulders and just wait for the wind to increase - if it will! "We're going in the right direction - we'll get there when we get there," is the kind of comment heard on the radio from one boat to another!! Beautifully clear, starry night sky - Milky Way so very clear and the occasional shooting star. I'm spending way too much time, morning & afternoon, trying to connect to Winlink/Sailmail - think I'll have to cut down on my efforts and make a big connection effort every two days instead! I've had no proper connection to Winlink since 6th April - I presume my radio transmit problem is at least partly to blame. 1800 GMT position: 01deg 18'S, 132deg 25'W . 24hr distance run by log: 96 n.ml.!! (110 ml over the ground) Distance to Fatu Hiva anchorage: 667 n.ml. Day19 Friday13Apr07 - Across the Equator! "Nereida" crossed into the S hemisphere today - HOT sun, calm sea, clear sky... & hardly a breath of wind - the Doldrums! So motor plus sails most of the day... couldn't even drift over the equator around 1.30pm PST - too light a wind from 'abaft the beam'. A lovely, relaxing day to remember - I had a refreshing, long shower on deck & we had a little 'party' lunch/tea - and, yes, even Neptune/Poseidon had his share of 'champers' - as a true nereid, we could not but take care of him...! Eventually turned off the motor as 11kn of NE wind came up after midnight - but have now (Sat 0530 PST) had to turn it on again .... boat doing well under 2kn!.. Oh well, back to sleep for an hour or so... At least current is fair again just now! All content and photos on this website copyright © Jeanne Socrates - All rights reserved world wide except where noted.